When the human spirit is beset by the crossfire of death, poetry revives it. Since the dawn of humanity poetry congregated, celebrated life, initiated in the mysteries, and sweetly passed on knowledge. It was thus humans discovered the powers of the spirit, their creative capacity and the transforming potency of language. The human essence is embodied in its ability to dialogue and in its symbolic interchange, both developed in each one’s conscience and estimation of existence. Through poetry one can conjure the drive of death and gain access to the vision of a superior world, in which peaceful coexistence is possible. This thought has supported the existence of the International Poetry Festival of Medellín during two decades, as an organic part of a society that demands it as banner of its imagination. Poetry teaches us to see and express what we are and will be, what we were and will not be. Poetry is the true richness of peoples, of their traditions, its invaluable heritage. When the life of humanity is in danger because of the destruction and catastrophe of war, poetry manifests itself as a cohesive force, as the protecting energy of the young people sent century after century to the slaughter house. Poetry is the substance every dream is made of. Every creative act is inherent in poetry and peace would be unreachable without that will of creation. Now, more than ever, one needs the voice of song, the revitalizing word expressing and manifesting its opposition to war and exclusion. Three generations of Colombian young people have been lost in bloody actions of war and violence, serving the paramilitaries, the State, the guerrillas, the criminal gangs of paramilitaries and common criminals. It is now that poetry must act much more, taking root in the souls of young people, to make visible in them unprecedented dimensions of human life, through the restoring exercise of language, in a city like Medellín where again bands of paramilitaries and mafia criminals freely increase the statistics of violent deaths. Each year, when the Festival is held, the city is totally transformed, new forms of seeing, understanding and changing life are created. Poetry gives to the population the tools to confront, listen to and transform itself, because it is a drive to life. Poetry is a song that humanizes the conscience of all. It is necessary to strengthen the International Poetry Festival of Medellín in its twentieth year, so it can give greater consistency and spread to its actions, in benefit of a population which has been said to be the greatest public of poetry in the world. According to the voice of the public, as expressed in recent surveys, the International Poetry Festival of Medellín is: Blaze. Ambrosia. Illumination. Universality. Energy. Ocean. Fascination. A house for all. History. Energy. Spirit. Reconciliation. Calm. Unity. A collective dream. Growth. Multiplicity. Transformation. Delight. A net. Interaction. A space of peace. Communion. Beauty. Privilege. The soul of the city. Knowledge. Daring. Celebration. Flight. Life. Passion. Hope. Renewal. Movement. Awakening. Integration. Multiplicity. Inclusion. Identity. World connection. Freedom. The unexpected marvelous. The origins of the International Poetry Festival are directly linked to all the history preceding us, as a nation that has struggled in intricate socio political conflicts from the colonial times to our own days. It could be said that the Festival arose as an answer to all the attacks on the human spirit that have taken place in a context of 45 national civil wars that have plunged us into fratricide and genocide in the course of two centuries. In 1991, the International Poetry Festival of Medellín was created to stand against all the horror of our history, materialized in the fratricidal violence unchained by the clash of different warring powers. Medellín acquired the stigma of the world’s crime capital. The population was completely silenced and hidden. Political murders were everyday news. The streets were the scene of massacres. Bomb attacks, selective murders. Every day there were dead people, many of them anonymous, adding up to a terrifying, nightmarish atmosphere. In the face of this horror, the poets gathered around the Prometeo Latin American poetry magazine proposed a lucid and coherent answer: the creation of a poetry festival as reaffirmation and celebration of life – as a way of resisting and creating in the face of a culture of slaughter, promoted by dark, chaotic forces. Thus was created the committed and constructive participation of an audience that has become increasingly qualified in the course of two decades. The Festival’s organic movement has materialized in its growth, both quantitative and qualitative. Year after year, the Festival has qualified itself and grown in its spiritual level and in its achievements as a poetry action that strongly influences society. In this perspective of fulfilled aims, genuine world recognitions came, such as the Alternative Nobel Prize, awarded to the Festival in 2006 in the Swedish Parliament. This recognition shows that the Festival’s history has been a route, a standard to be followed in the world scenario of nations who need spiritual oxygen to defeat the asphyxia of oppressive and socially turbulent conditions. In 2009, too, a law of the Republic of Colombia declared the Festival a part the National Cultural Heritage. The Festival has received the National Congress’s highest decoration, two decorations from the Council of Medellín and one from the Medellín City Hall. The International Poetry Festival of Medellín has grown as one of the most important poetry festival at a worldwide level, as confirmed both by the guest poets and even by the directors of other festivals; this is why it is intended to promote the cohesion of the International Poetry Festivals of countries in the five continents. This action also characterizes the Festival as a pioneering event in the globalization of poetry for the benefit of both the world poetic expression and the social groups which give a meaning to the scheduled activities. The International Poetry Festival of Medellín is an essential act that delves deep into the human soul, celebrates the luminous condition of the human being, and inscribes it into the exercise of freedom, through the powers of poetry. Its light has an impact on the awareness and perceptions of an audience for whom the spirit prospers and resists the affronts of a reality steeped in violence and degradation. At the level of its dreams, the Festival is visualized as a ceremonial centre in which poetry becomes the bridge that connects us to the sacred, to the emancipating forces of being, having its purest root in poetry, for living and transforming the inner world of those who consent to its influence. This celebration places us in a trans-historical orbit of cultures interacting through their representatives, the poets hailing from the five continents. The Festival’s dynamics generate an exulting wave of moving awareness, of language that turns on the senses and tunes emotions and perceptions. 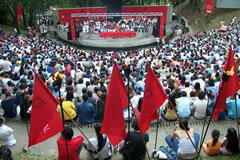 In its human and existential plenitude, the International Poetry Festival of Medellín is revealed as the bursting of the liberating spirit, as a universal sign that points to the need to integrate all the shards into which the human being has been shattered due to being subject to devastation, over-exploitation and the abuse of power. Another essential aspect which justifies the Festival’s permanence, and thus the realization of more than twenty-second issue, is its educational character, due to its natural pedagogic projection, for the city reveals itself as a plural space for the convergence and appropriation of knowledge which is manifested and shared in the context of the different scheduled activities. 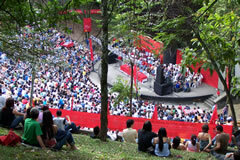 The Festival’s actions constitute a contemporary pedagogy in which the protagonists are the dwellers of the city, in this case Medellín, a town of two and a half million souls which needs these educational activities that forge a new awareness and a new attitude towards the living, for peaceful coexistence and spiritual and cultural growth. This twenty-one-year-long experience enables us to project a new stage in the development of the International Poetry Festival of Medellín as a proactive and proposal-making actor aimed at a society which is en route to existential, spiritual and cultural plenitude. Insofar as this purpose is fulfilled, we will be dealing with deeper transformations which will prepare the nurturing earth for the sprouting of the seed of a human race that is freer, more like its dreams, more like its dignity, which has been compromised by the contingencies of a history of affronts and attacks on the spirit. The cognitive acquisitions promoted by the Festival are demonstrated by a population with more poetry referents and able to assess the status of poetic expressions at a worldwide level. Because knowledge that is obtained through the poetic experience comes from a source intimately linked to the collective subconscious, associated to the words’ rhythms, which unleashes new ways of perceiving the world through an expansion of awareness towards the messages given by current events and universal archetypes. Thus the city enters into the dynamics of learning and self-discovery of its creative potential, which liberates through the word elevated to the levels of song – of the verbal expression that gives dignity and opens paths of light for the conscience. (Additionally, the International Poetry Festival of Medellín has become the seed for a universal poetic force. On July 4 to 8, 2011, it hosted the World Meeting of International Poetry Festival Directors, and within that context it propounded and argued the imperious need to create a World Poetry Movement. That is how World Poetry Movement –WPM– (www.wpm2011.org) came into being; as of today it includes 104 international poetry festivals, 70 international poetry projects and 630 poets from 120 countries on Earth. WPM is a dynamic, orbital projection movement, and will warmly accompany humankind’s presence in the near future, in defense of all life on Earth).